While the EHF EURO 2016 is still waiting for the champions to be crowned, several European handball teams are already looking ahead to the next major event: the Men's World Championship 2017 in France. The top three teams from the EHF EURO - so all but one of the four semi-finalists Norway, Germany, Spain and Croatia - will qualify directly. Hosts France are also directly qualified which leaves nine more places open to European teams participating in the 24-nation tournament in January 2017. These nine places will be decided in the play-offs in June this year, with the draw taking place on Sunday 31 January at Krakow's TAURON Arena following the closing press conference of the EHF EURO 2016. 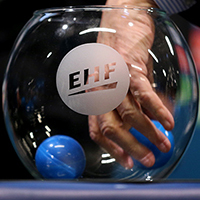 The draw will start at approximately 13:30 hrs and will be streamed live on ehfTV.com. With the better part of the ranking at the EHF EURO already decided, the seeding for these play-off matches is also pretty clear. Belarus, Denmark, Hungary, Iceland, FYR Macedonia, Poland, Russia, Sweden and the eventual fourth ranked team at the EHF EURO 2016 will be in Pot 1. Pot 2 is made up by the teams from Montenegro, Slovenia, Serbia (the three lowest ranked teams at the EHF EURO 2016) as well as Austria, Bosnia-Herzegovina, Czech Republic, Latvia, Netherlands and Portugal. At the draw - nine times overall - one team from Pot 1 is drawn against one team from Pot 2.